Soapy water application and then squeegeed off for a dry finish. Wiping of the sills and immediate frame work. Purewater polewashing technology. Purewater is brushed onto the glass and surrounding framework, working at the dirt with a specially designed brushead, then rinsed clean using ulta-purewater deposited from integrated jets inside the brushead. Leaving you with clean glass and framework at the same time. This method is also safer for the cleaner as no ladder is needed. Check out the videos below for more of an explanation. 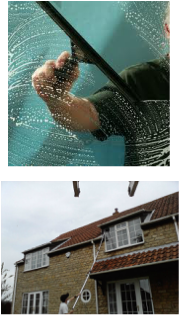 It is up to you how often your windows are cleaned, fortnightly, monthly etc, the majority of customers in my current working-round prefer monthly, while others prefer every 6 weeks. Again, it is up to you, as and when, and we shall try and cater for your window cleaning needs. We also provide advanced bookings, one-off cleans and on-demand call-outs. The Pure Water Method Cleans the Frame Not Just The Pain, At No Extra Cost!